We leave Marrakech and it's famous Djemma (plaza) of food vendors, entertainers, snake charmers, and mopeds for a quieter countryside drive. Early fog gives away to blue skies with some high clouds. It is a beautiful drive up to the snow-covered peaks through hairpin turns and a multitude of scenic views. I wish knew more about the geology of the region, because rocks and mountains changed at every seeming bend in the road. It started out with terraced hillsides with deep stream-carved valleys below. We saw a whole range of snowy tops, with the sun glistening off the mountain sides. 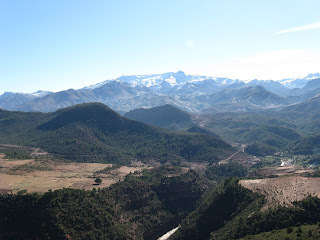 The highest peak is called Tizi-n-Tichka pass, which at 7400 feet, is the highest pass in Morocco. The landscape then became very much like our American southwest, some looking like the reddish-oranagey Grand Canyon, other areas looking like southern New Mexico's Robledos with their more muted tones. There was one mountain that was a light sage green, and it appeared to be that shade not just from its vegetation, but from whatever minerals were in that hillside. We saw very angular, cubic looking hillsides and mountains, many at odd angles, having been thrust up by plate tetonic movements eons ago. All different, all gorgeous. 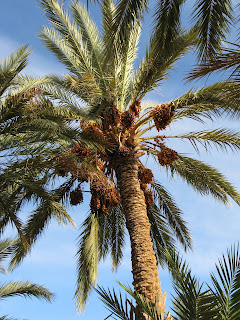 We stopped for lunch in Ouarzazate, which is known as the Hollywood of Moroccco, as there are at least 3 movie studio sets & soundstages there. Movies like Kundun, Gladiator, The Mummy, and Babel have all been filmed around this region. Brad Pitt was known to walk around town. Lunch was at a place owned by a Greek, called Dimitri's, and it was filled with photos of movie stars of the years gone by. A nice spinach soup and chicken tagine. Another 2 hours down the road to Zagora, which is the beginning of the Sahara. Our hotel is a sprawling place, with the rooms built around a center courtyard and pools. We arrived just as the sun had set, and navigating some of the dark passageways to find our rooms was amusing. The lights were not on, and once we figured out there were light switches in the halls, that made it a bit easier. This place though has a bit of an abandoned feel. Not out of neglect, but for the size of the place, there's just not many people here besides us. Dinner was soup and another chicken tagine, with wine in honor of Tom's wife's birthday and their anniversary.